as part of "Specialty Rotation" (including P.E., Library, Music, Art). Citizenship, Responsibility, Caring, Respect, Trustworthiness, and Fairness. Character Education curriculum is intended to help children gain a greater understanding of themselves and others, make wise choices, and become productive citizens of our community. 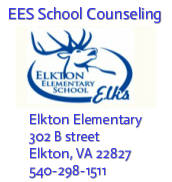 At EES we believe prevention education is the best practice for addressing the topic of bullying, and classroom guidance instruction is part of the EES "Choices Program". We teach and model correct social and life skills that demonstrate respect toward others. We address: how to identify and label emotions, communication skills, diversity and tolerance, problem-solving skills to deal with peer conflict, anger management, identifying ways to help ourselves and support others who are in conflict, labeling inappropriate behaviors that are never acceptable, and what to do if you are a victim of or witness an act of harassment.